Whether you’re divorcing or separating, starting over on one income can be hard under the best of circumstances. If you’re looking to buy a home or refinance the marital home into your own name, qualifying for a mortgage can present an additional challenge. Fortunately, many lenders consider spousal and child support as income under some circumstances. The trick is to make sure your separation really is legal, not just an informal arrangement between you and your spouse. The term “legal separation” doesn’t mean the same thing in all states. For example, you can file a petition with the court for a separation order in Ohio, just as you would if you wanted a divorce. You can ask the court to resolve issues of property, support and custody at trial, or you can negotiate a settlement agreement with your spouse and submit it to the court to be incorporated in an order. Other states don’t recognize this process. In New York, being legally separated means entering into a binding written contract with your spouse – a separation or property settlement agreement – that addresses issues of custody, support and property. In either case, you’re legally separated, but depending on where you live, you must take at least one of these two steps. The logistics of qualifying for a mortgage are the same whether you’re married, separated or divorced -- with one major exception. If your spouse pays you child support or alimony under the terms of a contractual agreement or court order, this may be income to you that could help you qualify. 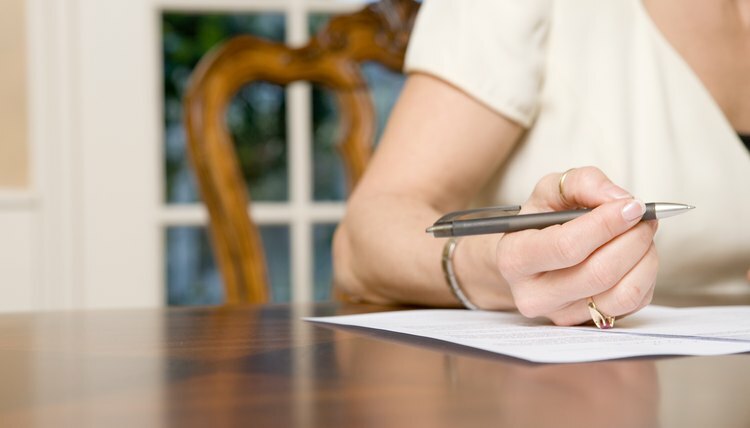 The lender will require a copy of your judgment of separation or a signed and notarized separation agreement, and the document must spell out the terms of the payments you’re receiving. In most cases, the payments must extend for at least three years after you close on the property. If you’re to receive child support until your child turns 18 and he’s currently 16, this won’t work. The lender will calculate how much of your available income these support payments represent. If your other income is $45,000 a year and you receive $15,000 a year in support, the support contributes 25 percent to your overall available resources. You can use this income toward qualifying for a mortgage after your spouse has paid you for six months. If the support contributes 30 percent or more to your overall income, he must pay you for a full year before a lender will consider this income. It’s not enough that your spouse has been obligated to pay you for six months or a year, he must actually have done so. Proving this to a lender may involve submitting your bank statements if they clearly and regularly show receipt of the money, or – in the case of child support – you might be able to submit a printout from your state’s child support collections unit showing a history of payments. If you receive alimony, your tax return can prove receipt because you’re obligated to claim this as income. Partial payments don’t count, and if your spouse is consistently late or the payments are otherwise unreliable, this might hurt your chances. If you do qualify for a mortgage, your spouse has no legal liability for the debt, assuming he’s not a co-borrower. Likewise, the house is all yours – your spouse will not have a community property or equitable distribution claim to it if you eventually decide to divorce. In most states, a legal separation curtails any interest you or your spouse may have in property owned or liabilities owed by the other beginning with the date the court issues a separation judgment or you sign a settlement agreement. New York State Unified Court System: What is Legal Separation by Agreement of Parties? LaMonaca Law: Child Support and Alimony Income – Can It Be Used to Secure a Mortgage? Divorce is a difficult emotional process that can also take a terrible toll on the finances of both spouses. If one spouse is awarded money in the final divorce decree, that money might be necessary to pay essential expenses or even to avoid bankruptcy. But when the spouse who is ordered to pay does not, the other spouse is left to wonder: what happens now? Collecting the money awarded in a divorce decree requires the receiving spouse go back to court and file a Motion for Contempt.